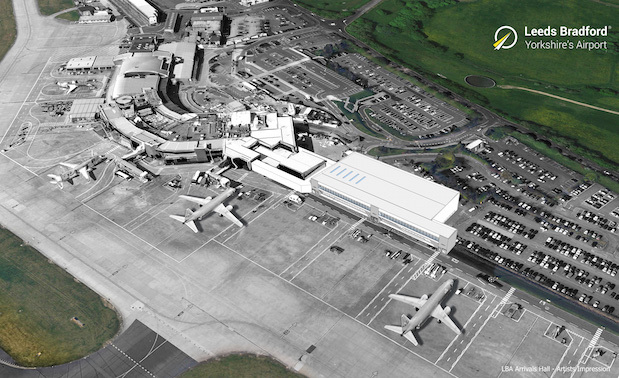 Leeds Bradford Airport has announced plans for a multi-million pound extension to its terminal building. The three-story scheme, marking the next phase of the airport’s ongoing redevelopment, will accommodate a transformed international arrivals area that includes immigration, customs and baggage reclaim. The extension will also house new bigger departure gates, as well as new retail space, food and drink outlets and seating. When the building is complete at the end of 2019, work will start on re-modelling Leeds Bradford’s existing terminal to create a new security central search area, enhanced check-in facilities and an improved retail and food-drink offering. The second phase is due for completion in Summer 2020. The final phase will see a new two-level pier built to replace the airport’s current passenger walkway. Leeds Bradford Airport chief exec David Laws said: “These really are exciting times for this airport and we are delighted to be able to now share our plans for phase two of our terminal redevelopment. He continued: “A thriving region needs a thriving airport and we hope the people of our great county will see these latest plans as a real statement of intent as we continue to strive to create an airport Yorkshire can be proud of.